Hayley told BuzzFeed News her tween self wanted to do a “message in a bottle,” but leave it on the beach. She didn’t have a bottle, but she had a softball. “I thought it would be really cool to see if anyone ever actually would find the softball,” she wrote. “I was just chancing it with the cute boys part, I thought it would be fun,” she said. The person initially joked with her that their name was “Adam,” but eventually revealed her name was Kelci and she was from North Carolina. “I just felt compelled to text her for some reason,” Kelci said. 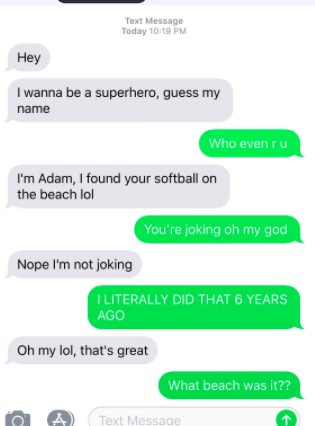 She said she initially used a fake name because she wasn't sure who exactly she'd be texting.